No blogging this week as I'm spending the next several days with family here in Wheaton. Here's a fascinating-looking book about someone I know next to nothing of (HT: Ref21). In his opening prologue, John upends both Greek and Jewish core worldview assumptions. Greek thought assumed anthropological dualism--division between body (bad) and soul (good). Jewish thought assumed theological monotheism--one God, the Creator, who stands above creation, never to dirty himself by getting too close to it. John blasts both the Greek view of man and the Jewish view of God. If the Evangelist had only said that the eternal Word assumed manhood or adopted the form of a body, the reader steeped in the popular dualism of the hellenistic world might have missed the point. But John is unambiguous, almost shocking in the expressions he uses: the Word became flesh. Among the Jews there suddenly turns up a man who goes about talking as if he was God. He claims to forgive sins. He says he has always existed. He says he is coming to judge the world at the end of time. Now let us get this clear. Among Pantheists, like the Indians, anyone might say that he was a part of God, or one with God: there would be nothing very odd about it. But this man, since he was a Jew, could not mean that kind of God. God, in their language, meant the Being outside the world who had made it and was infinitely different from anything else. And when you have grasped that, you will see that what this man said was, quite simply, the most shocking thing that has ever been uttered by human lips. Looks like Google Book Search, which I use incessantly, is getting a facelift. One manifestation of pride in my life is a marked internal disparity between the speed with which I note the faults of others and the slowness with which I note my own faults. As the gospel continues to sink in, one result I want to see more of is slowness in noting the faults of others and haste in seeing my own. I am quick to note evidences of grace in my life and sins in others; I am slow to note evidences of grace in others and sin in my life. This doesn't mean to consider others faultless. Jesus admitted my brother does indeed have a speck in his eye. But the log is the issue. When I see the sins of others, I too often remind myself how typical it is, congratulate my own avoidance of such a thing, place myself over them, put it in my mental spotlight; in truth, I rejoice at it. When I see my own sins, I excuse it, emotionally compensate for it with what I deem to be my strengths, stifle it. In 2009 I want to be quicker to mourn my own sins and to note evidences of grace in others, and slower to note others' sins and evidences of grace in myself. I am grateful for Chris because he understands and loves the gospel; he has a big vision of God; he loves his people; he preaches God's Word rather than his own ideas; he is not a people-pleaser but a people-lover and a people-challenger. All praise to God. I am grateful for Karen because she is able to engage others' worlds in ways most of us fail to do; she has determined that she will rejoice in the Lord whatever the circumstances; she has loved my wife in remarkable ways; she has courageously used her teaching gifts in the local church and around the country. All praise to God again. So, Stacey and I were on a date last night and reflecting on how grateful we are for Chris and Karen, and it gives me joy to share our thankfulness for them with anyone who might stumble across this blog today. Just got the Together for the Gospel Live album, on this recommendation. Wow. The first link above gives samples of all tracks and three free downloads. We'll be focusing on the deliberate contrast between Zechariah and Mary in Luke 1-2. Both have an angel appear to them and tell them they'll be having a kid shortly. Both have reason to be surprised, as Elizabeth, Zechariah's wife, is old, and Mary is a young virgin. But Zechariah responds in disbelief, and Mary with (puzzled) faith. The surprise is that we would have bet on Zechariah to come through as the faith-filled one every day of the week and twice on Sunday: he was a man, married, and a priest (of the Aaronic line no less), a grizzled old saint and servant who had served God all his life. And the angel met his in the temple! Mary was a woman, young, and unmarried. On top of that, for Zechariah to have a kid would have been great news. For Mary to have a kid meant disgrace, as it would appear to be the result of immorality. The insider is out, the outsider is in. Good news for Dane Ortlund--in my best moments, I see that I, in my sin, am an unmitigated outsider, turned, in Christ, to become an insider. Just discovered this fascinating webpage and organization, with which I deeply resonate. Covenant Seminary has revamped their ministry resources page. It's now called Resources for Life. Also, many M.A. classes have been made totally free by the seminary for downloading through iTunes. A few I've benefited from are David Calhoun on Calvin's Institutes, David Chapman on NT Theology and History, and Hans Bayer on Paul. I think it was Jaroslav Pelikan who defined tradition as the living faith of the dead, as opposed to traditionalism, which is the dead faith of the living. I could hardly state my own epistemology better. I would call myself a postmodern conservative. I am postmodern in that I believe that every worldview begins with specific presuppositions (Cornelius Van Til) or basic beliefs (Alvin Plantinga), is best understood as a distinct narrative (e.g., the biblical worldview is creation, fall, and redemption), and is unable to objectively prove itself to someone who refuses to be convinced. I am postmodern because I concede that everything we know is filtered through our unique perspective. And yet I am conservative because I believe that our finite and often flawed thinking is able to know the truth about God, ourselves, and the world. I am also conservative because I believe that right doctrine matters as much as good behavior, and in fact the latter only truly proceeds from the former. Full interview here. Thanks for doing this Justin. I'm reminded (by the last sentence of the first paragraph) of how Vanhoozer helpfully puts it in a few of his books: our knowledge of God and ourselves is neither absolutist (extreme modernism) nor anarchic (extreme postmodernism) but adequate (not exhaustive, yet sufficient). I'm working on a project currently called 'Strength through Weakness: Divine Favor and Its Paradoxical Prerequisite,' tracing a theme all through the Bible: the theme of paradox, the counterintuitive way in which God blesses people, the way the weak triumph and the strong are shamed. I detect two sub-strands: (1) God's approval comes to those, counterintuitively, who admit they ought not to have it; and (2) God's power comes to those, counterintuitively, who divest themselves of self-dependent effort. In other words, at the inauguration and in the course of the Christian life, both positionally and existentially, in justification and sanctification, new birth and growth, the initial blessing and ongoing blessing, God for us and God in us--in both dimensions, God's favor comes not to those who think they qualify but to those who know they don't. It's shot all through the Bible. And still sinking in to my own heart. Has a new website. Looks great. bear reluctant witness to the truth that our real goal is elsewhere. When they want to convince you that earth is your home, notice how they set about it. They begin by trying to persuade you that earth can be made into heaven. . . . [And] lest your longing for the transtemporal should awake and spoil the whole affair, they use any rhetoric that comes to hand to keep out of your mind the recollection that even if all the happiness they promised could come to man on earth, yet still each generation would lose it by death, including the last generation of all, and the whole story would be nothing, not even a story, for ever and ever. . . .
Do what they will, then, we remain conscious of a desire which no natural happiness will satisfy. My son Zachary is two and a half. I'm starting to see what Jesus meant. For fallen people, part of the process of growing up into adolescence is the increasing emergence of self-consciousness. As we become teens, we become more and more aware not only of our world but also of ourselves. And over several years, we construct a self-filter. The Self-Filter is a kind of social and emotional strainer that reminds us, before everything we say or do or decide: "Hey, be careful now. Don't forget others will be watching. Let's consider how this word/action/decision is going to be received, how others will respond to it, how they will react. So don't go overboard. Hedge your bets. Look out for number one. Remember, the most important thing is not the truth or propriety or benefit to others of what you're about to say or do, but how it will reflect on you." And slowly, Self rises to the forefront. And imperceptibly, joy wanes. "Unless you turn and become like little children . . ." Zach doesn't have the filter yet. Whatever he's thinking or feeling is clear as day. This can be a big pain - if he's unhappy, there's no ability for him to stifle that, as we stoic adults do. But if he's happy - and he usually is - it is a joy that is utterly unfettered by thoughts of self. Sometimes he starts saying silly things over and over with a smile on his face. Other times he starts telling me a story (yesterday it involved a baby monkey stealing bananas from a hissing snake, complete with monkey and snake sounds). Other times he just starts dancing around the kitchen, laughing. He loves dancing. Other times it means getting lost in Winnie the Pooh books. The point is: he's not aware of himself. There's no mental mirror. He's not self-conscious. He is a little child. "Unless you turn." I would like to be more like that. Is not the life of discipleship, the life of sanctification, moving from the adolescence of debilitating self-consciousness - many Christians die never having shed this - to the adulthood of childhood? To the maturity of childlikeness? An odd paradox. But possible, in the gospel. And it is what life in the new earth will be. Imagine. All of us will have shed the horrid Self-Filter and will be free of ourselves, free to lose ourselves in Christ and in lifting up one another. In the gospel, we can start to experience it now. On that day, we'll love dancing. The joy will be uncontrollable, and the filter will not be holding us back. I'm looking forward to this imminent book on one of the center doctrines of the two Great Awakenings, though largely sidelined today: the new birth. Just last night I was reading Joseph Alleine's An Alarm to Unconverted Sinners from the 17th century, on the new birth, and pondering how out of place his (biblically central) message sounds when placed next to today's Christian literature and preaching. I wonder how current justification and faith/obedience debates would be tilted if regeneration were brought more synthetically into the discussions. Think of the kings of Israel and contemplate their deeds: whoever among them feared Torah was delivered from troubles; and these were the seekers of Torah whose transgressions were forgiven. Think of David who was a man of righteous deeds and who was therefore delivered from many troubles and forgiven. The Qumran community got a lot right. When you read the scrolls next to Jubilees or 2 Baruch or 4 Ezra or other Jewish intertestamental writings, you see that the Qumranites had a deeper grasp of mankind's depravity, the greatness of God's mercy, the beauties of obedience, and the sovereign rule of God. But their gut instinct, and yours and mine, as to how God relates to his people, is: obey, and you will be counted righteous. Performance leads to an (earned) verdict. Paul's post-Damascus gut instinct--the gospel--is: be counted righteous, and you will obey. A (free) verdict leads to performance. So little is it the object of the Apostle in the Epistle to the Romans to emphasize the contrast between Judeo-Christian legalism and his Gospel, that he begins with a description of the corruption of the pagan world, which would be altogether irrelevant on such a supposition. It is not, as in the Epistle to the Galatians, the powerlessness of the law to save man, which is the prevailing thought in the Epistle to the Romans, though that comes in incidentally. It is the powerlessness of man, as such, to save himself, whether with or without the law, and the necessity of salvation by Christ, which is the great theme of the Epistle to the Romans.
. . . is of D. A. Carson. Very helpful. Thanks Dr. Dever. We have had enough, once and for all, of Hedonism - the gloomy philosophy which says that Pleasure is the only good. But we have hardly yet begun what may be called Hedonics, the science or philosophy of Pleasure. And I submit that the first step in Hedonics is to knock the Jailer down and keep the keys henceforward in our own possession. He has dominated our minds for thirty years or so, and specially in the field of literature and literary criticism. He is a sham realist. He accuses all myth and fantasy and romance of wishful thinking: the way to silence him is to be more realist than he - to lay our ears closer to the murmur of life as it actually flows through us at every moment and to discover there all that quivering and wonder and (in a sense) infinity which the literature that he calls realistic omits. For the story which gives us the experience most the experiences of living is not necessarily the story whose events are most like those in a biography or a newspaper. 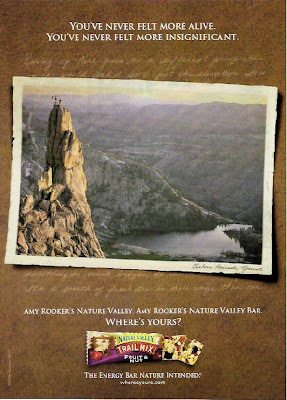 One of the ETS talks this week brought to our attention the following advertisement on the back of a National Geopgraphic magazine. If you can't read the top, it says, "You've never felt more alive. You've never felt more insignificant." There's a man at the top of the peak with his arms outstretched. A truth that taps into the core yearning of every heart - to be lost in something glorious. A yearning that is met only in Christ. Back from ETS. A fun time, more fun than I expected. Got to reconnect with old friends and make some new ones too. My paper went well. I return with new resolve to kill, with the gospel, the self-promoting instincts in my heart. Off to ETS . . .
. . . back this weekend. To fix it deeply in my mind that I have but one business upon my hands, to seek for eternal happiness by doing the will of God. Happiness through obedience. Not dutiful, stoic obedience. Not happiness via disobedience. But happiness through obedience. The only true obedience, the only true happiness. I was strengthened upon reading Paul Kooistra's most recent words in his MTW (Mission to the World, missions agency of the PCA) newsletter, in a short piece entitled "Strength through Weakness." From the little bits and pieces I have gathered of his life, I believe he learned what he says firsthand. The foundational principle of grace is that God's kingdom priorities are completely inverted from those of the world. God's plan is to magnify His saving mercy and grace not through human strength, but rather through its weakness. . . . God must wound us so we bleed pride and self-sufficiency before we are any good for His service. I took a class with Dr. Kooistra in January 2004 called simply "Living in Grace." Kooistra is a past president of Covenant Seminary and now the head of MTW. You might expect a rigid, sure, solemn man. Au contraire. He is one of the most relaxed leaders I've ever observed. He shared in class and has shared numerous times when he speaks, and so I expect he wouldn't mind my sharing here, that he had a mid-life nervous breakdown. The cure? Rediscovering grace. It changed him permanently, and it is a joy to see someone in significant leadership who is not self-conscious, not worried about his image, relaxed, okay with himself. Praise the Lord of grace. He can do it for you and me too. May God get us there (without a nervous breakdown). I've always been a bit perplexed about the second beatitude ('Blessed are those who mourn, for they will be comforted'), but John Stott's comments are illuminating. One might almost translate this second beatitude 'Happy are the unhappy' in order to draw attention to the startling paradox which it contains. . . . [T]hose here promised comfort are not primarily those who mourn the loss of a loved one, but those who mourn the loss of their innocence, their righteousness, their self-esteem. It is not the sorrow of bereavement to which Christ refers, but the sorrow of repentance. Pray for Westmost College, heavily damaged by a fire yesterday. The flames are now out. Pictures. News coverage here. College updates here. Thus says the LORD: "Heaven is my throne, and the earth is my footstool; what is the house that you would build for me, and what is the place of my rest? All these things my hand has made, and so all these things came to be, declares the LORD. But this is the one to whom I will look: he who is humble and contrite in spirit and trembles at my word." "This is the one to whom I will look: he who is humble and contrite in spirit and trembles at my word." Anyone got that built into their life? "He who is humble and contrite in spirit." I don't. But I want to get there. At this point in my emotional and spiritual development, at this point in my marriage, at this stage in my studies, I'm increasingly aware that there is nothing more needful. Against every fallen impulse to self-promote, this passage, a sheer and unmitigated declaration from the mouth of God, confronts me and will have none of it. But the result of such self-death is life. "This is the one to whom I will look." I would like God to look to me. And I am reminded today that the way to get that is by the very thing almost none of us are recognizing: he must increase, I must decrease. Which is exactly where the personal increase we all long for is found. Had there been no works, Abraham would not have been justified; but that would have been because the absence of works would have meant that he had no real faith. Nothing could be more counterintuitive for human beings after the fall into sin than to ignore the law with its demand that we take action. A helpful statement by James Dunn in connection with the previous post. Certainly we must be careful about defining Pauline Christianity simply as a kind of Judaism (continuity): but equally we must beware of falling into the old trap of thinking that Christianity can only define itself in opposition to Judaism (discontinuity). In this week's reading on Paul I have again noticed the way many Paul scholars see the unfortunate caricature of "Jewish legalism" as that which generations of past ignorant scholars promulgated. This is then addressed by showing how "Jewish legalism" is a misportrayal because Judaism was not legalistic, but a religion of grace. That is, the second of the two terms is addressed. In my opinion, resolution to the (largely appropriately diagnosed) caricature of "Jewish legalism" is not to tinker with the second term but the first. The problem is not "Jewish legalism." The problem is human legalism. Judaism, simply because they were the one group given a law, wound up, for all their blessings, being the group most clearly manifesting the result of combining human sin with divine law. The problem is not racial. Any of us who had been born into Judaism would have been just as clear examples of what Paul critiqued. It is humanity Paul critiqued, Judaism providing the clearest example of the problem. The solution to the caricature of Judaism as legalistic is not exonerating Judaism but co-indicting everyone. Instead of plucking Judaism out of the cooker, we should put the rest of us into it. A growing trend among Paul scholars is to call Paul's Damascus Road experience a "call" or "commissioning" rather than a "conversion." This is helpful in that it reminds us that Paul did not move from Judaism to Christianity, but from Judaism in infancy to Judaism in full blossom ("grown-up" Judaism - the law was, after all, a pedagogue). But I am increasingly frustrated by the way this proposal often leaves behind that which is fundamental to Paul (how sinful people can be right with God, in light of both their failure to keep the law and their frequent pride whent hey do keep it) for the sake of that which is important but secondary (the horizontal concern of gentile inclusion). Here's how, at this point in my development, I would answer. TO a Christ-climaxed gospel--Judaism brought to fruition--that realized both the failure to keep the whole law and the pride naturally engendered by those parts that were dutifully kept, and instead the utter gratuity of God's favor by virtue of the ultimate sacrifice, and therefore, derivatively, to see that favor as available to all. My favorite seminary has revamped their website. Looks great. By the way - I know every seminary says this about their faculty - this seminary actually lives it. Make sure to check out this incredible resource. And the seminary bookstore is now available online. Al Mohler on the new birth, and how some Buddhists (for a small fee) are seeking to be born again through an elaborate ritual that is the exact opposite of what Jesus prescribes in John 3. This first question and answer from the DG conference's second panel, concerning Bob Kauflin's 3-year experience of emotional darkness, is well worth watching. I find it a salutary reminder to my own heart to rid myself, in the gospel, of the quenchless quest for the approval of men. In his first 16 years of ministry, Bryan _______ took a church of 50 people in a 'run-down little building' on Long Island, New York, and helped it grow to a congregation of more than 500. His preaching and pastoral skills did not go unnoticed, and in 1999 he was offered the pastorate at Grace Chapel in Lexington, Massachusetts, a congregation of 2,000. Thank you, CT, for once again reminding me of what I'm not shooting for in pastoral ministry. The temptations to adjudicate significance as the world does already rage inside my sinful heart--do these unhelpful flames need to be fueled by evangelicalism's flagship magazine? Have the hundreds of faithful pastors who took churches of 50 people twenty years ago and are now at 60 people--or 40--"gone unnoticed"? Only by those whose notice will not, in the most important sense, matter. That's ok. God sees. As to ourselves, experience shows how slight impressions we have of the providence of God. We no doubt all agree in admitting that the world is governed by the hand of God; but were this truth deeply rooted in our hearts, our faith would be distinguished by far greater steadiness and perseverance in surmounting the temptations with which we are assailed in adversity. But when the smallest temptation which we meet with dislodges this doctrine from our minds, it is manifest that we have not yet been truly and in good earnest convinced of its truth. My hand is raised: guilty! David declares that he desires nothing, either in heaven or in earth, except God alone, and that without God, all other objects which usually draw the hearts of men towards them were unattractive to him. And, undoubtedly, God then obtains from us the glory to which he is entitled, when, instead of being carried first to one object, and then to another, we hold exclusively by him, being satisfied with him alone. Two new biographical sketches, both of them short, have just been released. One is George Marsden's A Short Life of Jonathan Edwards (120 pp), with an intriguing blurb from Tim Keller), which is evidently not a summation of his earlier biography; the other is James Byrd's Jonathan Edwards for Armchair Theologians (180 pp). I will definitely be reading Marsden's over Xmas, and probably wait to hear reports on Byrd's book. Thanks for more help in understanding this indescribably helpful Christian, gentlemen. On a recommendation from one of my brothers I'm slowly working my way through Robert Yarbrough's The Salvation-Historical Fallacy? Reassessing the History of New Testament Theology. I have been struck by the similarities between those who have taken a more existential (vs. salvation-historical) approach to biblical theology and the (dying?) emerging church. At one point Yarbrough describes "Bultmann's view of New Testament theology as a presentation of certain New Testament writers' believing self-understanding with reference to a kerygma which is conceptually ineffable and indescribable." Footnoting this statement for further clarification, he says: "I.e. its content is not accessible by cognitive means and does not admit to being expressed in or apprehended by means of propositional statements. The kerygmatic proclamation does not convey information but opens up relational possibilities." Whoa. For a moment there I thought I was reading one of our friends from the emerging church. The truth is, I have learned much from reading Doug Pagitt, Tim Keel, Tony Jones, Erwin McManus, and others. They have helped me. I approach theology and relationships with others and how to practically live out my faith differently (for the better) as a result, and I need to continue to listen to them, because many of them put hands and feet on their faith in a way that consistently, and rightly, rebukes me. But I see in both Bultmann and Co. (I would take it back to Schleiermacher) as well as some associated with the EC the same impulse to downplay concrete propositions for the sake of more fuzzy subjectivity in speaking of truth and knowledge--a downplaying which is, in my opinion, shooting oneself in the foot. It is in (not in avoiding) propositional clarity that existential experience of God ignites. I enjoyed discovering this in my dad's Isaiah commentary today, reflecting on Isa 31-32. Jonathan Edwards explained how the human being makes contact with reality. We know things at two levels. We grasp things with conceptual knowledge in our heads. We also enter into things with the sense of the heart. It’s the difference between reading a recipe for apple pie and actually putting a piece of hot apple pie a la mode into your mouth. God has made us to know him at both levels – with the thoughts of our minds and with a sense in our hearts. And it’s the sense of the heart that gives us traction. When his assurances in the gospel melt into our hearts, we experience the power of hope. I had never heard that name until I read on the back of one of my Schlatter volumes that Schlatter ought to be mentioned in the same breath as all the greats of biblical theology - Augustine, Calvin, Luther, Bengel, Schlatter. Well, I knew of most of these extraordinary men, of course, but I had never heard of Bengel. Then while interviewing for my current doctoral program I discovered a plaque on my supervisor's wall, a quote from Bengel: "Apply yourself wholly to the text; apply the text wholly to yourself." So I thought I'd try to figure out who this guy was. 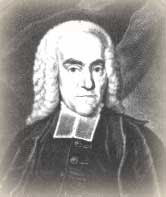 Evidently Bengel (1687-1752) was a pietistic Lutheran pastor and then scholar in Germany in the 1700s. The way I read his lifespan is by comparing him to my two main historical heroes: he was a contemporary of Jonathan Edwards (1703-58), and he died 100 yrs before Schlatter was born. Six of his 12 children died young. Bengel is known largely for an edition of the Greek NT he compiled. Anyhow, there is a very old (1837) biography of Bengel, written by John C. F. Burk, and translated from German into English by Robert F. Walker. To indicate the roots of the appreciation of these two men for Bengel: they were both pastors, Burk in Wuertemberg, Germany, Walker in Oxford, England. Included in this biography are a few letters. Here's an excerpt from a letter written to his mother as he was traveling through Germany that gives a flavor of Bengel and the passions that drove him. . . . . I enjoy the consoling assurance, that our faithful God and Father in heaven continues to keep up in you that desire after himself and his everlasting mercy, which has long found its place in your heart; and that he will make it still stronger and more ardent than ever. O yes, this one thing is that which 'our soul longeth after' in the present transitory state. The few days that may yet remain to us in this life, cannot be more happily spent that in seeking, with constant care and diligence, to become partakers of the heavenly inheritance. Great as this inheritance is, its attainment is secured, if we only heartily desire, accept, and lay hold of it. In ourselves we have neither strength nor worthiness for that purpose; nor can any prosper spiritually who have not known and felt the reality of their own wretchedness, misery, poverty, blindness, and unfitness for all good. But in Christ Jesus are freely bestowed for our everlasting possession, the forgiveness of sins, the gift of righteousness, the peace of God, spiritual rest, consolation, joy, strength, life, fullness of content and satisfaction; and we have only to prostrate ourselves before the throne. . . .
And now I commit all this to that sure and certain blessing, the gracious favour of my faithful God and yours. On him let us venture all; to him let us commit every thing. . . .
We are pleased to inform our beta testers that we had a successful WJE Online 2.0 Beta testing. * WJE Online 2.0 Beta testing ran from August 15-September 15, 2008. * We want to extend a big thank you to all those who have participated. Without your active involvement in contributing reports to the site, we could not have made it what it is today. * Special recognition is given to: John Piper and Jerry Stutzman for submitting the most number of bugs/suggestions! * Please continue to make use of the WJE Online 2.0 Beta, but please note there will be changes and things might get broken, so please pardon our dust as we finish for the birthday. * On October 5, 2008 (birthday of Jonathan Edwards) we will launch WJE Online 2.0 that will consist of 73 digital volumes! Sermons, Series II1,200+ Sermons are arranged chronologically, though the number of volumes and divisions between volumes is subject to change due to length of given sermons. Volumes in Series II would include the transcripts and edited texts of previously unpublished sermons; transcripts of published sermons would be linked to the versions published in the Yale edition. I hadn't realized before one of the connections Jacob's wrestling with God has with the surrounding context: the word "face" and its importance. In Gen 32 Jacob is approaching his probably enraged brother Esau and is terrified. To appease his brother (v. 20 uses the Hebrew word kipper, "atone") Jacob sends on ahead gifts (flocks, etc). Jacob thinks to himself, "I may appease his face with these gifts" (v. 20). Then he adds, "Then afterward I'll see his face" (v. 20). Jacob is terrified of meeting Esau face to face. The immediately following passage then tells us of Jacob's wrestling with God. And in the wake of the struggle, Jacob gives the name of the place a certain name: Peniel (v. 30). "Peniel" in Hebrew means "face of God." His explanation? "For I have seen God face to face" (v. 30). The next verse then says it all: "The sun rose on Jacob as he passed, limping" (v. 31). After Jacob and Esau meet and the reunion goes happily, Esau attempts to refuse Jacob's gifts, but Jacob insists that Esau keep the gifts. Why? "For I have seen your face which is like seeing the face of God, and you have accepted me" (33:10). Jacob had to face Esau, yes. But that was only a mirage, an echo, of what Jacob really had to face. He had to confront Esau, but he more deeply had to confront God. He had to be reconciled to Esau, but more fundamentally to God. Jacob had been manipulating his circumstances his whole life in order to put himself in a position of strength--a fascinating study in itself. God finally had to manipulate Jacob himself in order to put him in a position of weakness. Jacob had to learn that it was not his circumstances but him that needed fixing. Only then could Jacob face Esau with the most important verdict behind him. However, Jesus changed the question the third time and Peter was disappointed (grieved). Jesus knew that Peter’s best was phileo at this time. He also knew that Peter would experience agape for the first time at the coming of the Holy Spirit during Pentecost. We all know what an impact that had on the rest of Peter’s life and ministry. We are encouraged and motivated by Dane in his book, “A New Inner Relish,” to seek the fullness of God that leads to whole-hearted obedience. It is the filling and inspiration of the Holy Spirit that brings us to that place. Unlike Peter, we don’t have to wait for the coming of the Holy Spirit since we have full access to God’s transforming power at the moment we accept Christ as our personal Lord and Savior. 15When they had finished breakfast, Jesus said to Simon Peter, "Simon son of John, do you love (agape) me more than these?" He said to him, "Yes, Lord; you know that I love (phileo) you." He said to him, "Feed my lambs." 16He said to him a second time, "Simon, son of John, do you love (agape) me?" He said to him, "Yes, Lord; you know that I love (phileo) you." He said to him, "Tend my sheep." 17He said to him the third time, "Simon, son of John, do you love (phileo) me?" Peter was grieved because he said to him the third time, "Do you love (phileo) me?" and he said to him, "Lord, you know everything; you know that I love (phileo) you." Jesus said to him, "Feed my sheep." Agape is the main word used for “love” in the New Testament. There are three principal Greek words which can be translated as “love” in English, each with different connotations. The two most common were eros, which refers to sexual love, and phileo, which means friendship or brotherly love (eros does not appear in the New Testament, but phileo does). Answer: Go down to your basement in the middle of a heavy rainstorm and see what is coming out of your lowest drain at a high velocity. Chaotic weekend as Stacey and I enjoyed a flooded basement. We now realize what a walk in the park it was last time this happened, earlier this spring, when it was only water. Let's just say I would rather discover what my neighbors eat for breakfast by simply asking them. There are some things squeegees should simply never be used for. From what I understand we were certainly not the only ones with flooding and sewage damage; this was a record rainfall for Chicagoland over these 48 hours. Doubtless many others had it a lot worse than we did. At times our street was submerged in about 2 feet of water; we could only see the top of the fire hydrant. Stacey and I watched the radar map online as the massive system that was Hurricane Ike slowly moved across Illinois. Chicago was right in the middle the whole time. I am grateful for a helpful landlord and an ever-optimistic and cheerful wife. Well hey, at least the rain stopped about 38 days earlier than it did for Noah. And, most importantly, no books got damaged. Ah, well. Back to zeal in Sirach. Found this site today which has dozens of online Bible translations collected in one place. I have never understood the standard Democratic combo of support for abortion and yet opposition to the death penalty. Surely it is the guilty rather than the innocent who deserve execution? In talking with my wife Stacey this week I have come to see one more reason I feel so smiled upon by the Lord in this season of life. When I ask other guys my age about their job, sometimes I get the very clear impression that while they have some genuine interest in what they do, their job is a means to allow them to do what they really want to do (in the evenings and on the weekends). I have known what that's like with past summer jobs etc. But for me, for this season of life anyway, my job is what I want to do. I get up in the morning, go down to the basement, and study the Bible all day. Wow. God has given me the desires (internally) and then the opportunity (circumstantially) to fulfill the desires. Wow. I'm not saying I never get weary of what I do. I have disappointments and discouragements and days when I want to just quit and go be with Jesus, just like anyone else. But that's the minor chord. The major chord is: I love it. Wow. Thank you, Lord. One undeserved mercy after another continues to wash into my life. What about you - do you go to work to free you up to do what you want to do, or is your work itself what you enjoy doing? Maybe it's time to reassess. Immanuel Church in Nashville has started up their podcast, and Pastor Ray Ortlund has just started a trek through Romans. Join me in listening in! A good word for students writing dissertations in biblical studies, and a reminder that is far too rare. A conference on Edwards has been announced - in Scotland! I was fascinated to hear the following interchange about 13 minutes into the most recent interview posted at 9Marks. Mark Dever is interviewing Os Guinness (who, evidently, is a direct descendent of the founder of Guinness beer). In speaking of his calling, Guinness asserts that he is "between the church and the world." Dever asks: "And would be a kind of academic who is not tied to a certain educational institution?" Guinness: "No. I went ot Oxford to do a DPhil. And there I had a real sense that my calling was not academic. I call it the 'missing middle.' You've got magnificent scholarship in the church. There could be a lot more, but it's magnificent scholarship. And you've got lots of wonderful, faithful people in the church who will do whatever the Lord shows them to do. In many ways there is a missing middle: you could call it the intermediate level of knowledge. So my calling is to make sense of serious scholarship--make it intelligible, make it practicable, to people who don't get into that world. But I am not an academic scholar." Dad has started a new series of posts on how believers in Jesus can learn to live in peacefulness and quiet in the midst of the frenetic lives we live in the twenty-first century West. Very helpful stuff as usual. A deconstructive anecdote on our motives when we get up to preach or teach the Bible. [H]e who is tired of doctrine is tired of life, for doctrine is the stuff of life. Christian doctrine is necessary for human flourishing: only doctrine shows us who we are, why we are here, and what we are to do. The stereotype of doctrine as dry and crusty cuts a flimsy caricature next to the real thing, which is brave and bracing. Doctrine deals with energies and events that are as real and powerful as anything known in chemistry or physics, energies and events that can turn the world we know upside down, energies and events into which we are grafted as participants with speaking and acting parts. --The Drama of Doctrine: A Canonical-Linguistic Approach to Christian Theology, xiii. Volume 26 of the Yale critical edition of Edwards' works is out. Another man I love is moving back into pastoral ministry, at this church. Today through this weekend, no thoughts or quotes or links or reflections or news. Just gratitude for these two, my two favorite people in the universe: my wife Stacey and son Zachary Edwards. The worst part of my day: leaving in the morning to walk to the library to study all day. The best part of my day: walking home. The JE Center at Yale announces the impending availability of full online search capacity of the Yale critical edition of Edwards' Works, which right now sits at 25 volumes. The Works of Jonathan Edwards Online 2.0 (WJE Online 2.0) is getting ready for the Registered User’s Beta phase. We invite you to participate in a month-long testing of our new release: a fully searchable digital interface through which anyone can explore Edwards' written thoughts. "At 7:15 PM on Sunday, July 13, his heart stopped, and my heart broke." I have been married to my best friend for seven years. So had this dear sister. Sobering, heart-wrenching, encouraging, longing-igniting, idol-smashing. Thank you for helping me. I am currently working on a doctorate in biblical studies. A PhD does not address this. Louie Giglio and Chris Tomlin are starting a new church in Atlanta. One of my all-time favorite people in the world is Zack Eswine, whom I got to know during my five years (I was a slow seminarian!) at Covenant Seminary in St. Louis. Zack has recently left the seminary context to return to the pastorate: he'll be leading an EPC church in St. Louis: Riverside Church. God be with you, Zack. I love you. What is happiness and unhappiness? It depends so little on the circumstances; it depends really only on that which happens inside a person. As I listened to John Gerstner's 24 lectures on Jonathan Edwards four years ago, he mentioned one name more than any other, repeatedly drawing attention to the person he considered the definitive Edwards scholar of the twentieth century. That man, Thomas A. Schafer, died last week. One indicator of Schafer's love for Edwards and helpfulness to the rest of us: many of JE's manuscripts were undated, particularly pre-1733 sermons. Schafer took it upon himself to meticulously examine the water marks, handwriting, and paper quality of the manuscripts to diagnose their date. If only there were evil people somewhere, insidiously committing evil deeds, and it were necessary only to separate them from the rest of us and destroy them. But the line dividing good and evil cuts through the heart of every human being. And who is willing to destroy a piece of his own heart? In Christ, we have not only been given a chance to destroy the evil part of our heart; our whole selves have been slaughtered and remade. We are statues, as Lewis described, in need not of a bit of sculpting here and a bit of fresh paint there, but of coming to life. I was helped and encouraged by the following statment from John Barclay (Durham) in his explication of the relation of divine and human agency in Paul. [A]n essential feature of grace in Paul's theology is its inherent subversiveness, its tendency to call into question the normal methods of reward or the expected channels of delivery. This is mirrored in (and no doubt partly based upon) his own life-story. There was none more successfully advancing in Judaism, fulfilling the traditions of the ancestors and excelling in zeal for the law and righteousness, as defined by that law (Gal 1.13-14; Phil 3.6). But his encounter with the grace of God was emphatically not another stage in that advance, a further refinement to the righteousness he found in the law, but a total re-evaluation of all his norms, an act of God which undercut what he had previously held to be the definition of piety. This is nothing less than an experience of death, a co-crucifixion with Christ. . . . Crucified in baptism, believers live only inasmuch as they share the risen life of Christ; 'under grace,' they can now identify the crucial weakness of the law which was fatally exploited by sin. The depth of despair about the self here is matched by the shocking exposure of the inadequacy of the law; the power of the flesh can only be countered by the power of something newly present on the scene, the Spirit of Christ. Can't wait to get my hands on this new volume. I was unaware till today of this online resource, which looks very helpful, particularly for theological students with a pastoral bent. Apparently run by evangelicals in Britain. Lots of good stuff. Carson: Is the NT God Nicer? This weekend I listened to 3 lectures D. A. Carson gave at RTS (Charlotte) on the New Perspective, probably around 8 years ago (thanks for the tip Ben Gladd). It’s a fascinating listen. The way he addresses James Dunn is particularly interesting. The only downfall is that my brain struggles to keep up in listening, so I have to listen a few times to get everything. Anyway, in the third lecture Carson expounds Rom 3:21-31. Along the way he responds to the common sentiment—it is rarely asserted outright, but you often get the sense this is how people understand the Bible—that the God of the New Testament is a kinder, gentler God than that of the Old Testament. After all, the God of the OT commands his people to slaughter whole people groups. Dr. Carson responds in a way I had never considered. He says that he would argue that yes, the love of God is certainly “ratcheted up” in the NT. But the wrath of God, too, is ratcheted up. God’s grace and his wrath both blossom into full flower under the new covenant. Jesus himself, after all, spoke more of hell than anyone. And Rev 14 is frightful in its depiction of people being cast into the winepress of God’s wrath. If this is so, then why does the OT seem so barbaric to so many of us, especially compared to the NT? Here Carson made a fascinating observation. He said he believes that the reason people have more of a problem with the wrath of God in the OT than in the NT is because we don’t really believe in hell. We are far more fearful of war, pestilence, and the plague than we are of hell. As a result, the OT seems more frightening. In fact, says Carson, the horrors of the OT are only a foretaste of the true horrors of hell. 1) a new dissertation has been submitted that sounds fascinating--hopefully it will be published. Then they led Jesus from Caiaphas into the praetorion; and it was early. And they did not enter into the praetorion, in order that they might not be defiled but would be able to eat the passover. The efforts of Jesus' accusers, far from keeping them pure, were not only sinful but also the very thing that led to the ultimate passover sacrifice, a passover that, tragically, did not avail for them - because they were not, by faith in this passover, made pure. It was their wrongheaded attempt to be pure that defiled them.